The final week of my time here has begun. The last span of days has been so full of learning it is difficult to sum it up. The classes have been fantastic. Deep insights into inversions with Sunita, one of Mr. Iyengar’s daughters. Revealing pranayama with Rajlakshmi, a long time institute teacher. Clarity and precision in the rope work with Golnaz, another experienced RIMYI teacher. And invigorating backbends with Abhijata, Mr. Iyengar’s granddaughter. This is true wealth – the wealth of knowledge and experience. It is clear that I can only absorb a small portion of what is being given. At a feast, we cannot taste every dish or we become ill. So I am digesting what I can, knowing that through future practice, more will be revealed. 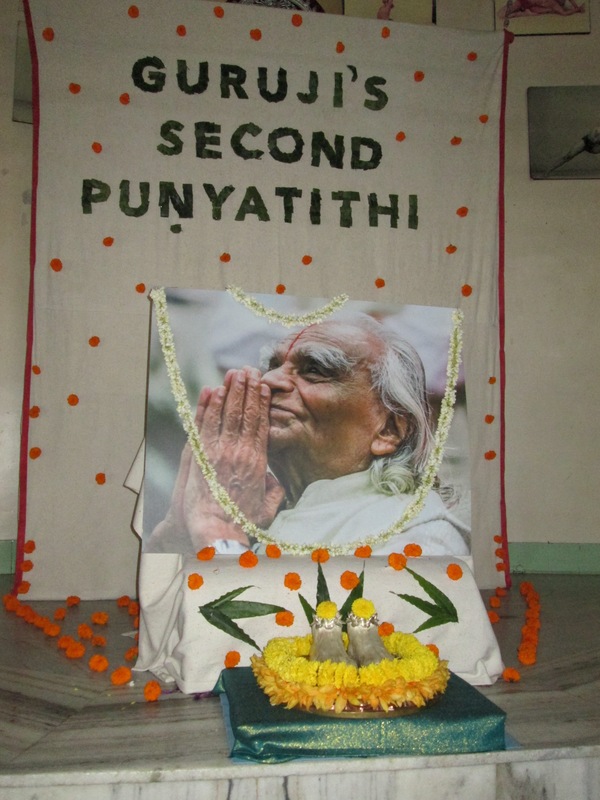 Saturday night was BKS Iyengar’s second “punyatithi” meaning the anniversary of his death. The hall was decorated and the red carpet rolled out for this auspicious occasion. Images of BKS and Ramamani Iyengar and Patanjali were garlanded with flowers, and the hall was decorated with images of Guruji and more flowers. We were invited to put on our finery and gather to pay homage to this great man. 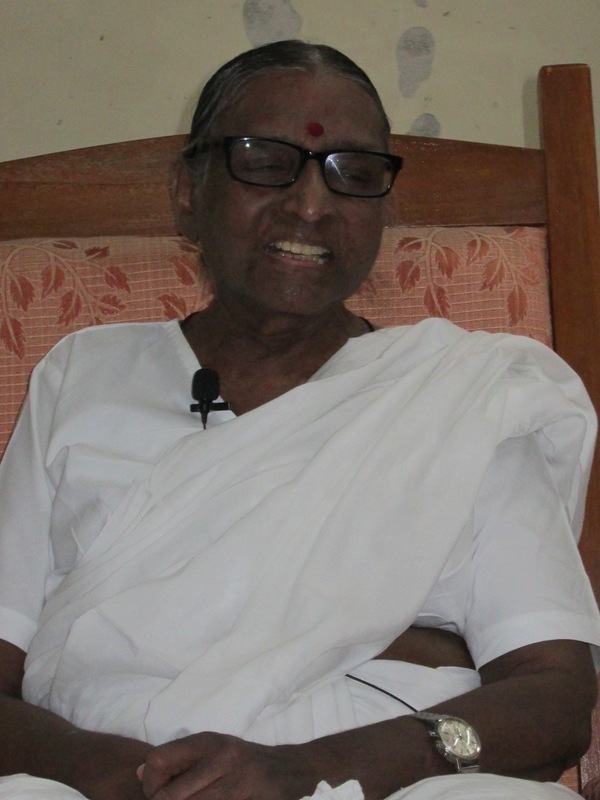 We were delighted that Geeta Iyengar gave an interview, responding to questions submitted during the previous week. Geeta has been suffering from ill health, but she was in good spirits. Her mind was sharp and her memory clear as she shared yogic wisdom and stories of Guruji’s life. 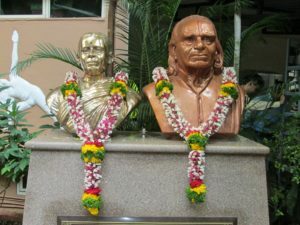 After the interview, we had the opportunity to give our salutations and respect to Guruji, taking turns to bow to golden sculptural images of his feet, garlanded with yellow marigolds. This evening was also the book release for two new works, Light on Yoga in Marahti, the native language of this area, and a new book, Beloved Guruji, based on stories and recollections from his students. We then flowed downstairs to purchase our books, have them signed by Geetaji and Prashantji if we wished, and to enjoy some prasad. “Prasada” literally means a gracious gift. It denotes an edible food that is first offered to a deity or master and then distributed to be enjoyed. 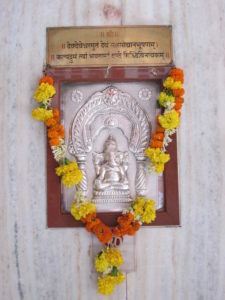 The prasada is considered to have blessing residing within it. So that brings me back to digestion! How can we digest such a rich meal? How can we integrate teachings that are so profound and vast, while also being rooted in practicality and common sense? Only through our regular, attentive and devoted practice can we receive the nourishment that this yoga has to give us. 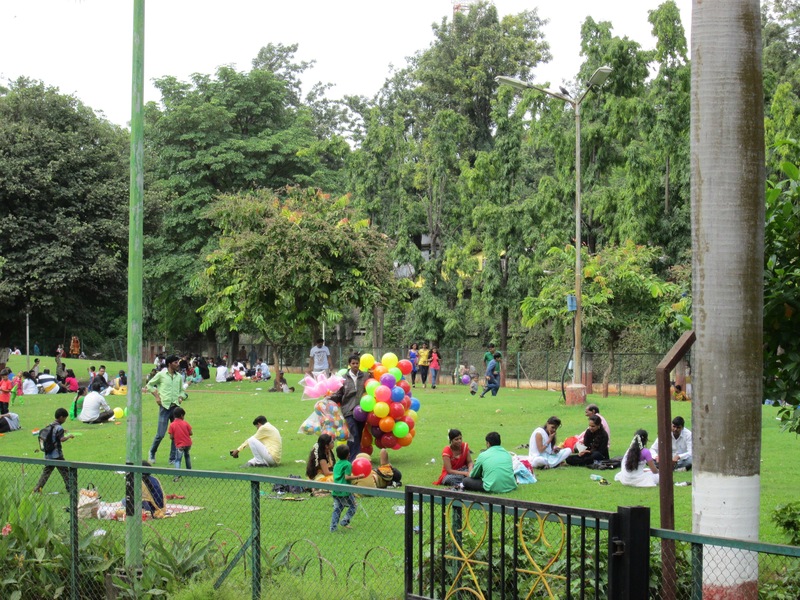 Monday August 15 was Indian Independence Day and a holiday from classes at the institute. It felt good to have a day off for rest and integration right in the middle of the month. 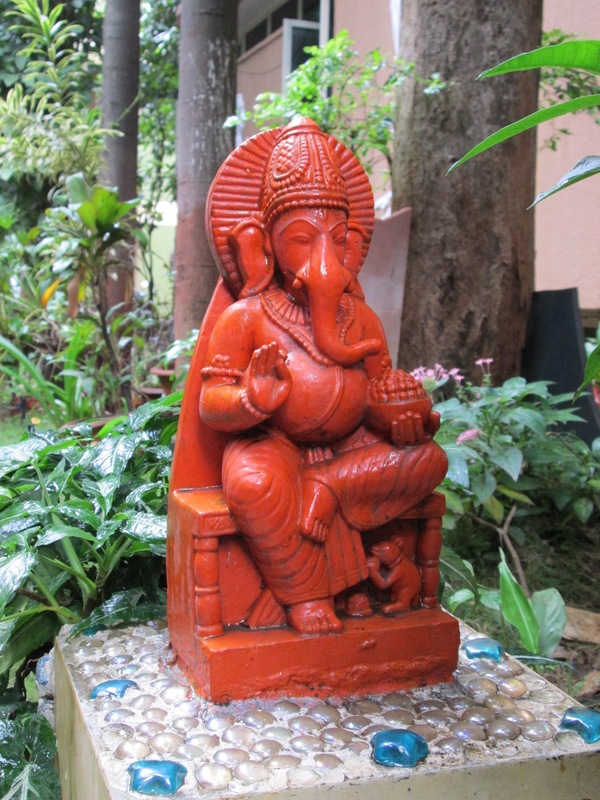 My flat mate and I took the opportunity to visit Sarasbaug Ganesh Temple. Ganesh is the elephant faced god who removes obstacles, especially obstacles to our spiritual growth. This deity may be invoked at the beginning of new endeavors. Ganesh is associated with the root chakra and the qualities of stability and security, while also revealing the potential for transformation. The Sarasbaug Ganesh Temple was a wonderful place to visit on a sunny day in Pune. The area surrounding the temple was like a carnival, with rides for children, street food and vendors selling flowers, coconuts and sweets to be offered to Ganesh. 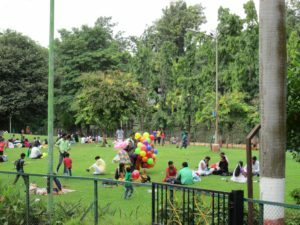 Inside the temple gates, there were lush lawns, ponds with lotus flowers, and more vendors selling balloons, toys and novelties. It was lovely to see so many families enjoying their holiday in an area that combined the features of a park and a church. Inside the temple, we circumambulated (reverentially walked around the deity image) the main shrine and made our offerings. I had the chance to become quiet and focus on my intentions for obstacles I hope to have removed from my life. 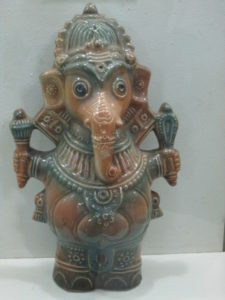 We then visited the amazing Ganesh museum that held literally hundreds of images of the elephant faced god, in many forms, sizes and materials. Back at RIMYI today, I find that my practice continues to deepen. I notice that small, nagging injuries that I have had for some time are gradually melting away. Windows are opening to both new and familiar poses that challenge me. Being in the yoga hall brings a state of calm awareness that helps the practice penetrate in a new way. One new aspect of this trip is that I am assisting in the medical class. This remedial class is for those with various injuries and ailments, as the Iyengars have developed protocols for numerous problems. As the students do their sequences on their own or in small groups, the Indian teachers and other senior teachers guide and adjust them with some support from teachers like myself. I was nervous about this part of my work here, and consulted several senior teachers at home about what to expect and how to behave. During the first week, there was a lot of watching. We were told to stand and that if our help was needed, we would be asked. During that first week, felt anxious to do something. I was there to learn and to be useful. Sometime during the second week, I realized that I was grasping – that I wanted to get something. I was trying to acquire knowledge and techniques like a collector. It struck me that my real purpose there was not to get something, but to serve the students. Once I made that crucial attitude adjustment, the work in the medical class changed its tone for me. From a more humble and student-oriented point of view, of course it is going much better! Life here is stripped down in such a way that it is easier to observe myself and identify where I may be going wrong. I am hoping to keep in mind the basic tenet of knowing what is to be cultivated and what is to be discarded. Every day has its obstacles, and every day is also a new beginning. 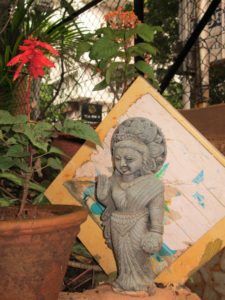 The neighborhood of the Ramamani Iyengar Memorial Yoga Institute in Pune is bustling with noise and activity from dawn until late into evening. 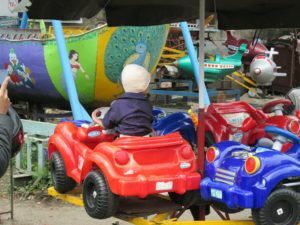 Many sounds fill the air – the sounds of motors and honking horns, lively birds and chiming bells, voices ringing out, whether chanting or selling vegetables. Yet within this cacophony, there is peacefulness and focus within the practice hall at RIMYI. 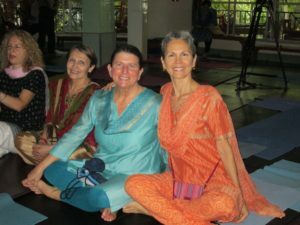 There we turn our minds inward to get a taste of yoga – integration, connectivity, and wholeness. 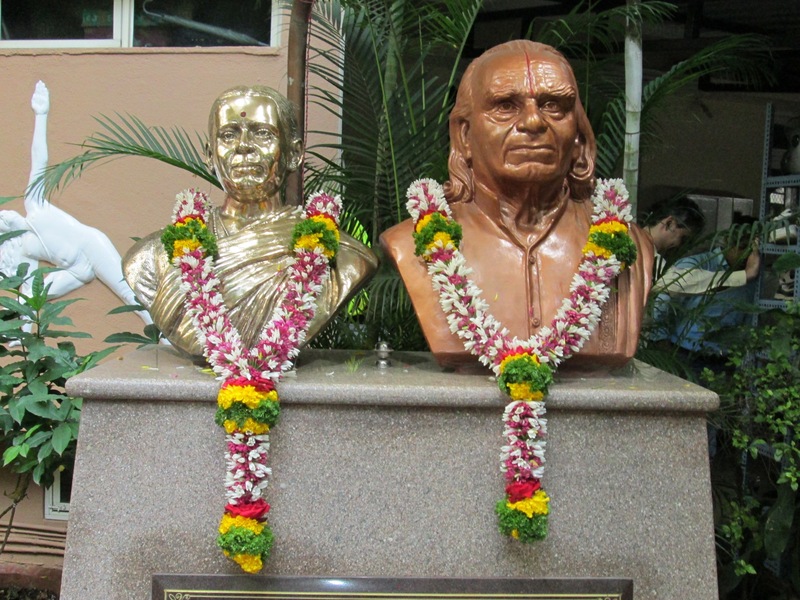 Walking through the gates of the institute, you are immediately greeted by busts of BKS Iyengar and his beloved wife Ramamani, for whom the institute is named. The building is surrounded by deity images, which are artistically beautiful and spiritually inspiring. These sacred icons help turn the mind toward sanctity, and help to leave the noisy world behind and enter the realm of the sacred journey inward. I continue to feel deeply relaxed and calm within the busy rhythm of my days. Prashant Iyengar’s brilliant teaching is bringing me to a new experience of presence. One aspect of his teaching is the way he describes philosophical concepts through his engaging use analogy and metaphor. In a recent class, Prashant explained that the senses can act like mirrors. When we get ready to go out, we first look in a mirror to see how we look. Then we want a cosmetic kit to enhance our appearance. Of course, cosmetic means superficial or on the surface. If we instead use the senses as mirrors to look inward, we will find that no cosmetic kit is needed. The unadorned beauty of our essential nature will shine with its own splendor. Prashant has emphasized this week that philosophy is embedded within us. Philosophy lives inside us. Philosophy reveals reality. By turning inside ourselves, by becoming the object of our own awareness, we may taste the ocean of bliss that resides within our hearts. With this type of teaching setting the tone for the day, I find that I am influenced to be calmer and more aware during practice time, while assisting in the medical class and even in everyday activities. I am so grateful. I am thinking of my friends, teachers and students with so much affection. Blessings of peace and love to all of you!